The name of the game today is an amazing fast and easy chicken dinner recipe! These 5 ingredient chicken Caesar pita wraps are super tasty, and come together in a flash – dinner on the table in under 10 minutes, that’s what I’m talking about! 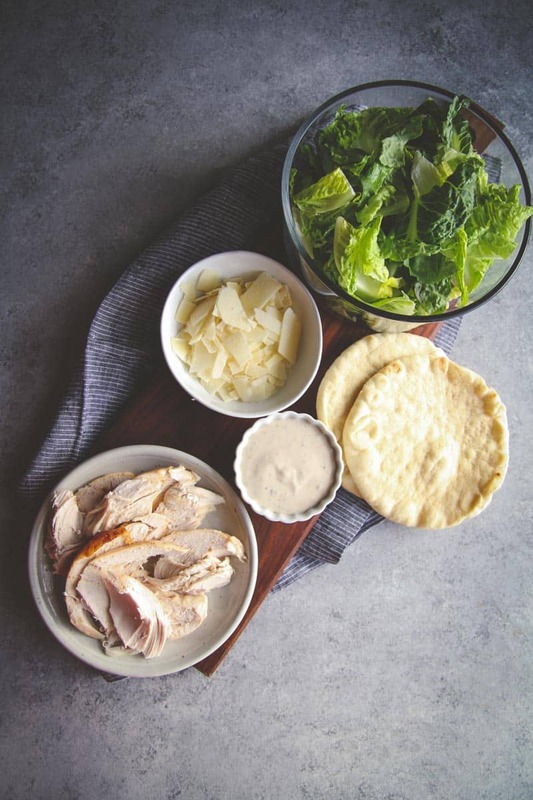 I first had a version of a chicken Caesar pita wrap when I was trying different meal home delivery services (you can see my comparison different meal delivery services here) and I loved the idea – it was like a chicken Caesar salad in a pita, like a gyro, super delicious, but healthier. The one thing I didn’t like, however, was that there was way too much prep involved for something so simple. 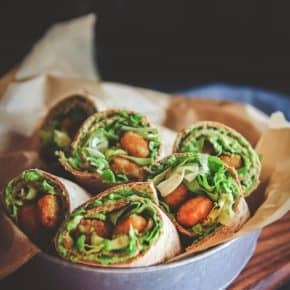 So of course I had to simplify the recipe to make it work in my everyday life, and I have to tell you, I’m so in love with this quick 5 ingredient wrap recipe (see other 5 ingredient recipes as part of my Five Ingredient Fridays series). If you’re short on time (like I usually am lol) I use already cooked rotisserie chicken. 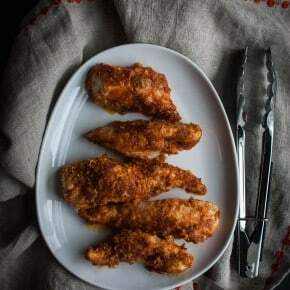 If I have a little more time on my hands, I like to simply bake chicken breasts and put about 1 tablespoon of Caesar dressing on them – the dressing acts like a marinade/sauce and really gives it great flavor. If you’re looking for another super quick and easy recipe these 5 ingredient Greek chicken bowls are another favorite! 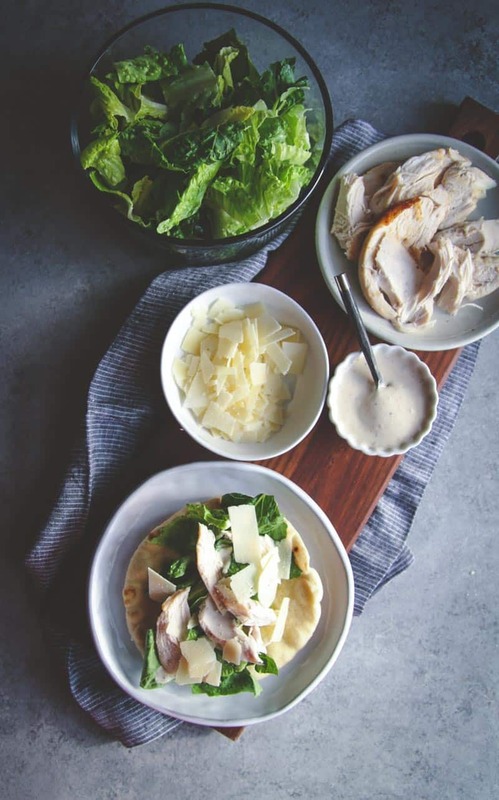 To make these chicken Caesar pita wraps, all you do is get some rotisserie chicken (or you could use the baking method I talked about earlier), salad, shaved Parmesan, your favorite Caesar dressing (I like the yogurt based Caesar salad dressings like this one) and some pitas. You toast the pitas, pile them high with lettuce, add on a little dressing, add chicken slices, sprinkle on some cheese and voila, dinner is done! 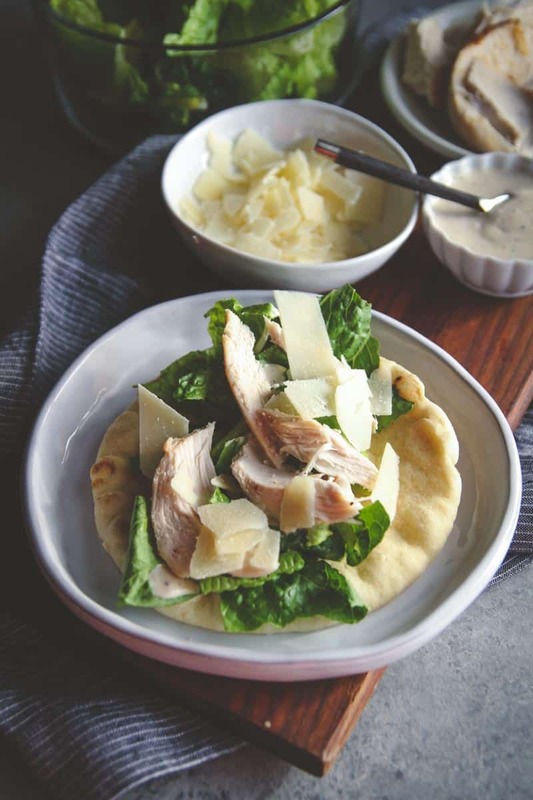 Next time you’re in need of a super easy 5 ingredient dinner or lunch recipe, these chicken Caesar pita wraps are sure to satisfy! While the pita is toasting, cut up the lettuce and chicken and set aside. 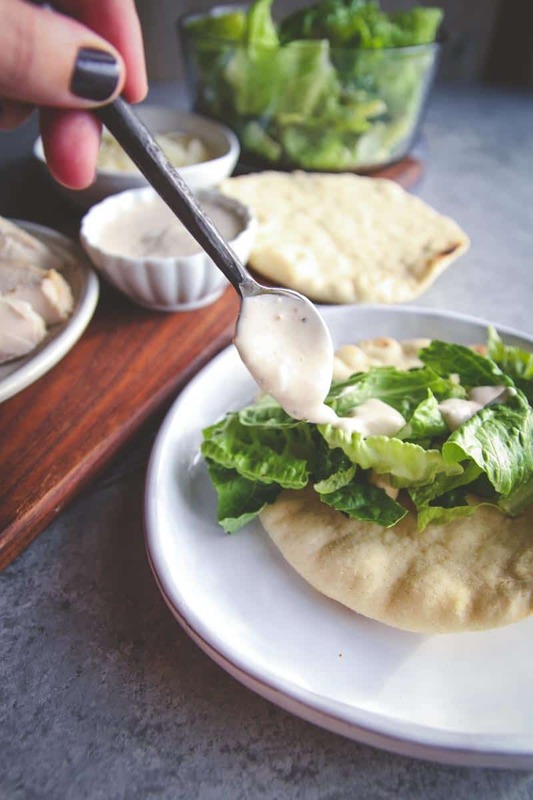 To assemble each pita wrap, place pita on a plate, top with 1/2 cup romaine lettuce (a handful), drizzle salad dressing on, add a few pieces of chicken (about 1/2 a chicken breast) and then top with a few pinches of Parmesan cheese, repeat with all pitas, and enjoy! hey girl- this looks so tasty! Hope y’all have a great weekend! That looks delicious and SO EASY! What brand of Caesar dressing did you use? 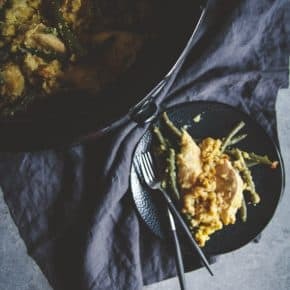 Love this 5 ingredient dinner idea!! Or lunch! Or snack! haha really any time! This looks so healthy and delicious – Caesar salads are a personal fave. Why thank you!! This definitely is a super easy weeknight dinner idea.